As the original terminal serving Austin-Bergstrom International Airport since it opened in 1999, the Barbara Jordan Terminal is accessed from SH-71. 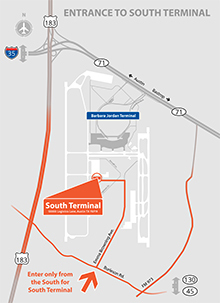 The South Terminal at ABIA is accessed only from the south boundary of the Austin-Bergstrom International Airport campus. Take 183 South or 130 to Burleson Road, turn onto Emma Browning Avenue and follow to the South Terminal. For more information on the South Terminal including directions, on-site parking and amenities, click here to go directly to the South Terminal website. To contact the South Terminal, call 512-601-6090. The South Terminal recommends using the WAZE app for directions. There is plenty of parking at the South Terminal and the rates are $16/day for short term and $10/day for long term. Non ABIA parking shuttles will not drive to the South Terminal but will drop you off at the upper level of the Barbara Jordan terminal. You will then need to take an ABIA shuttle from the Barbara Jordan terminal to the South Terminal and the estimated driving time is 20 minutes 1-way. ● Airlines serving the South Terminal.